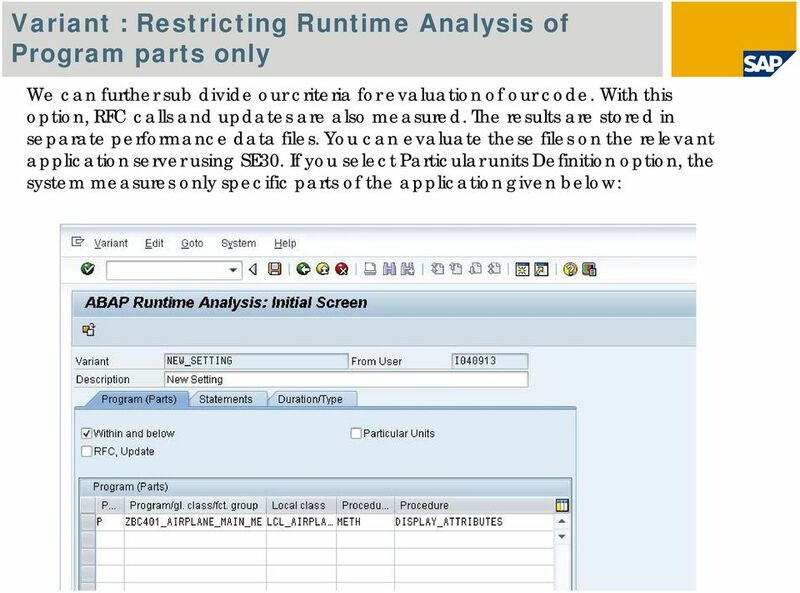 Download "ABAP Tracing using SAT"
2 Abstract : a Technical View A new ABAP Trace Tool (transaction SAT) has been developed, addressing major limitation in the SE30: For example Trace Storage User Interface Analysis Functionality Trace Comparison and more The Transaction SE30 is currently being phased-out. 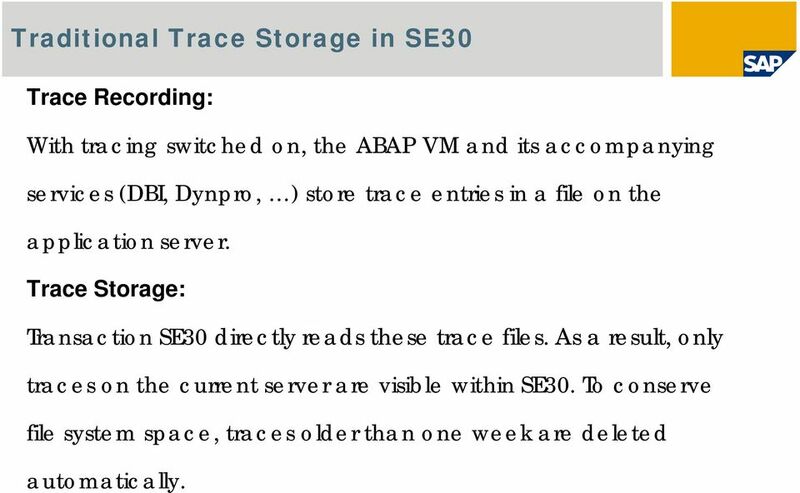 3 Traditional Trace Storage in SE30 Trace Recording: With tracing switched on, the ABAP VM and its accompanying services (DBI, Dynpro, ) store trace entries in a file on the application server. 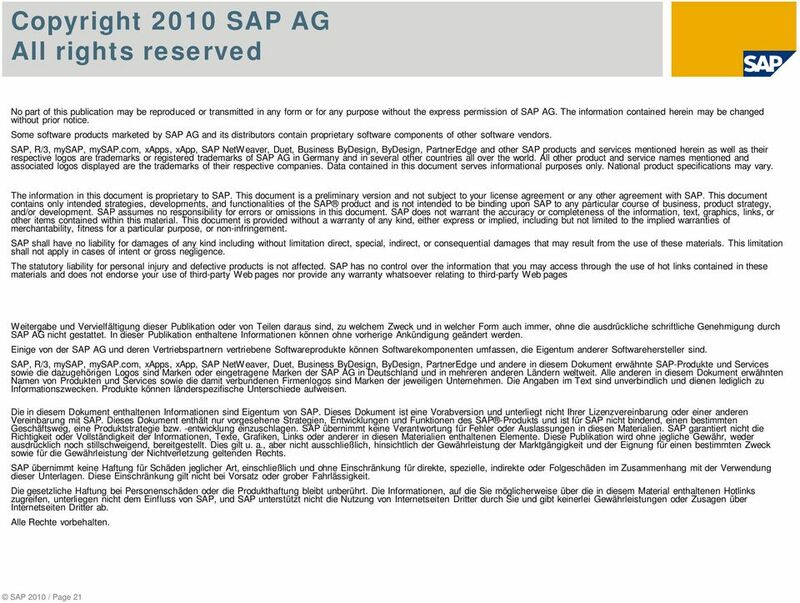 Trace Storage: Transaction SE30 directly reads these trace files. 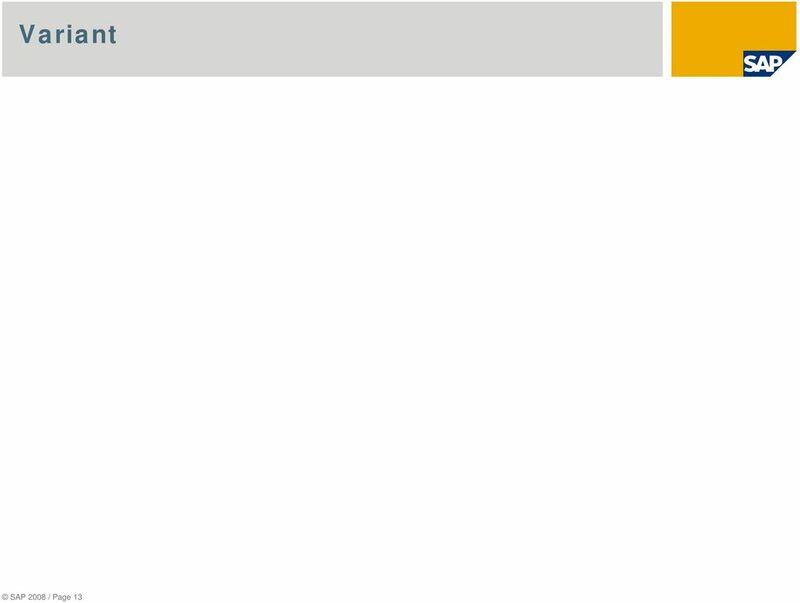 As a result, only traces on the current server are visible within SE30. To conserve file system space, traces older than one week are deleted automatically. 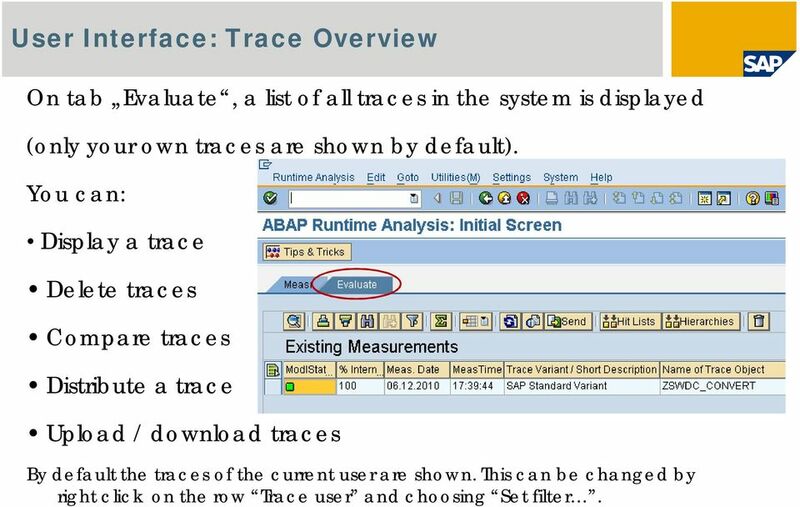 5 User Interface: Trace Overview On tab Evaluate, a list of all traces in the system is displayed (only your own traces are shown by default). 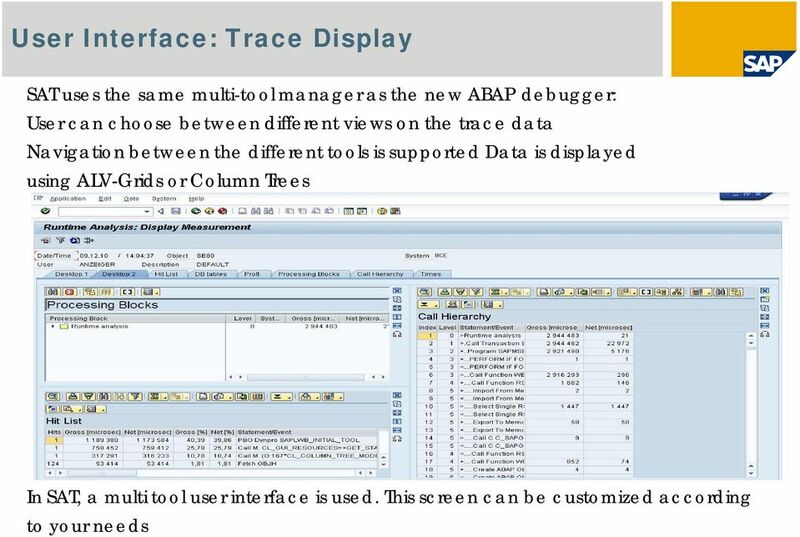 You can: Display a trace Delete traces Compare traces Distribute a trace Upload / download traces By default the traces of the current user are shown. This can be changed by right click on the row Trace user and choosing Set filter. 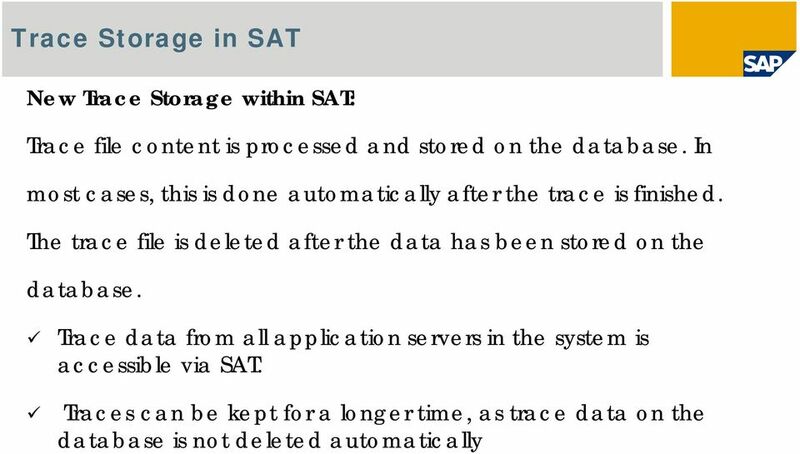 8 Trace Comparison With the new SAT transaction, different traces can be compared. This is helpful for instance to check the scalability. For instance, a program can be executed two times with a different amount of data supplied. 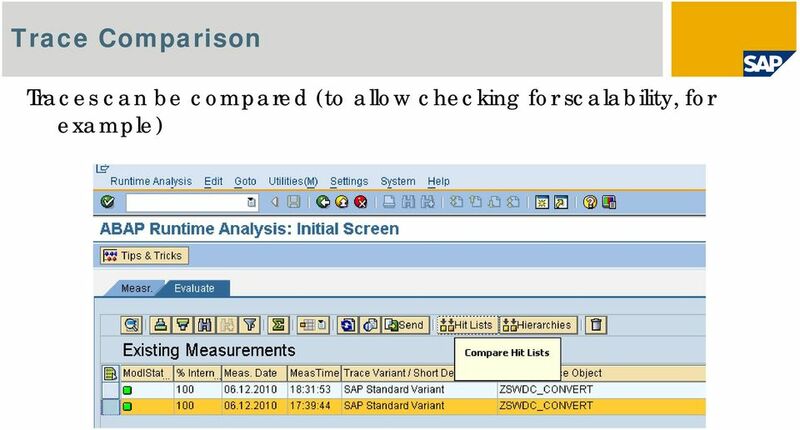 Each run can be traced and afterwards the traces can be compared to find out whether the program scales. 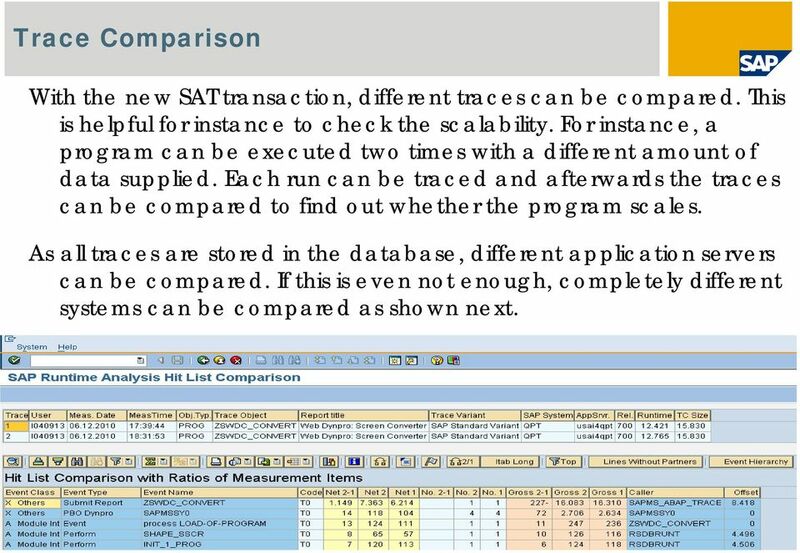 As all traces are stored in the database, different application servers can be compared. If this is even not enough, completely different systems can be compared as shown next. 9 Traces can be distributed to other systems via RFC We can compare our traces in different systems, the traces can be send to another system via RFC call. 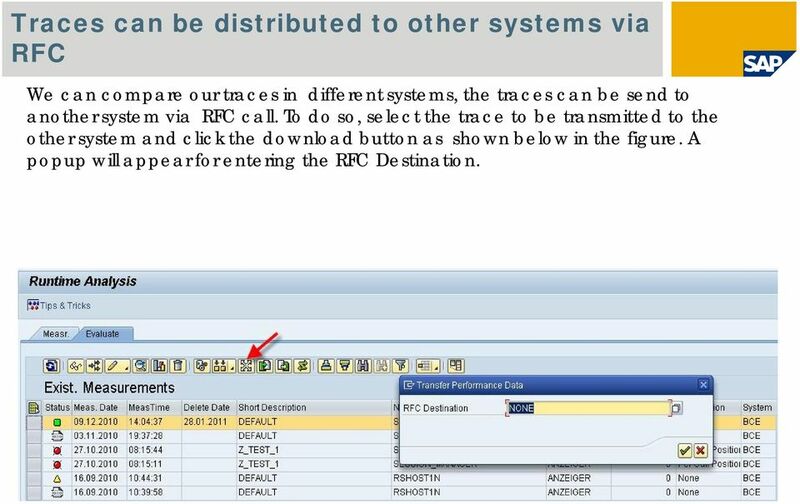 To do so, select the trace to be transmitted to the other system and click the download button as shown below in the figure. 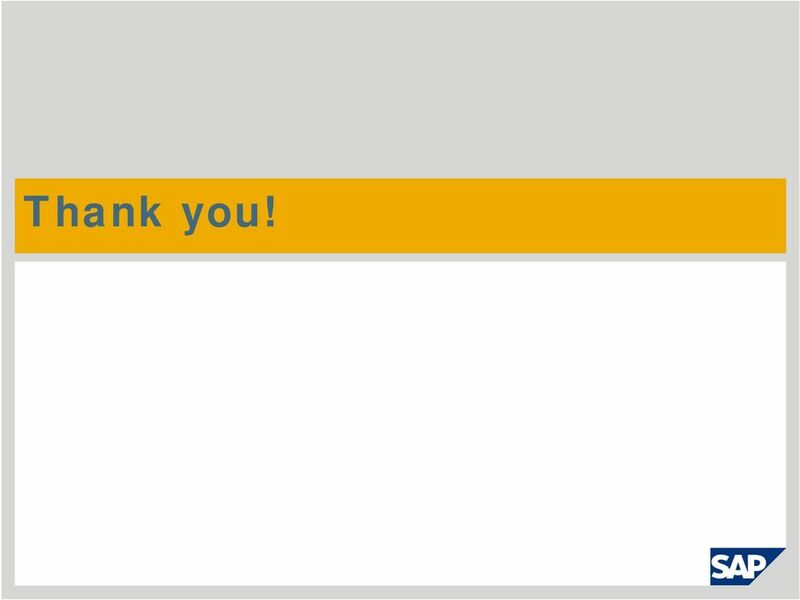 A popup will appear for entering the RFC Destination. 10 Traces can be distributed to other systems via frontend up/download We can compare our traces in different systems, the traces can be send to another system via RFC call. 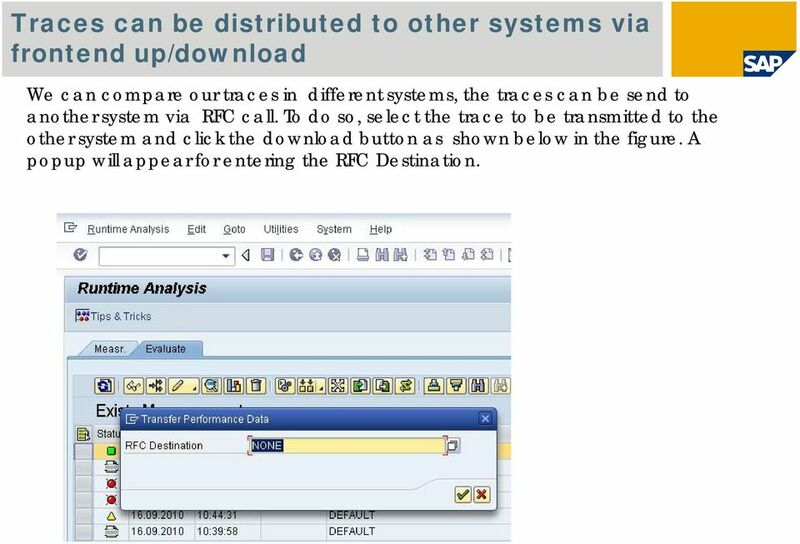 To do so, select the trace to be transmitted to the other system and click the download button as shown below in the figure. A popup will appear for entering the RFC Destination. 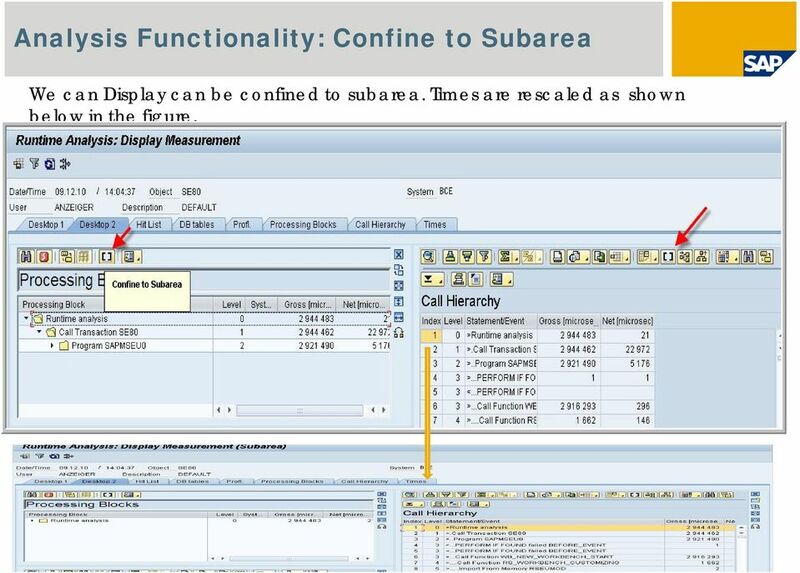 12 Analysis Functionality: Confine to Subarea We can Display can be confined to subarea. Times are rescaled as shown below in the figure. 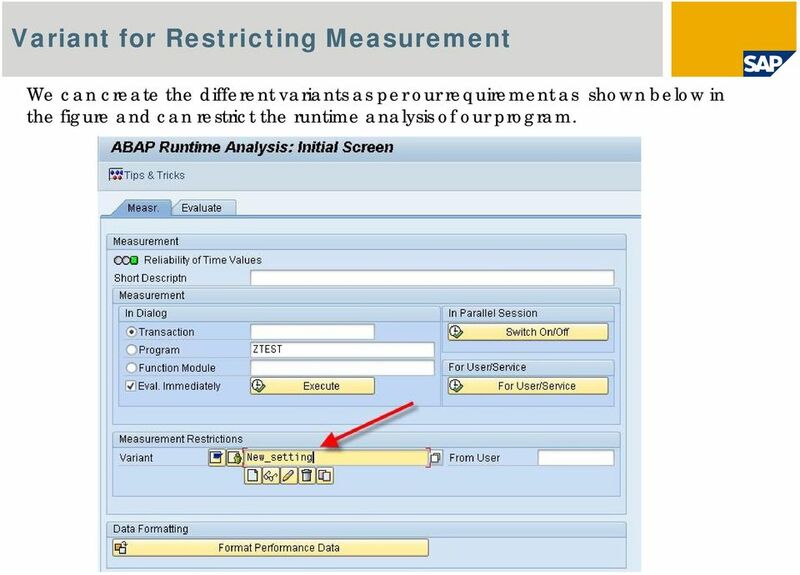 14 Variant for Restricting Measurement We can create the different variants as per our requirement as shown below in the figure and can restrict the runtime analysis of our program. 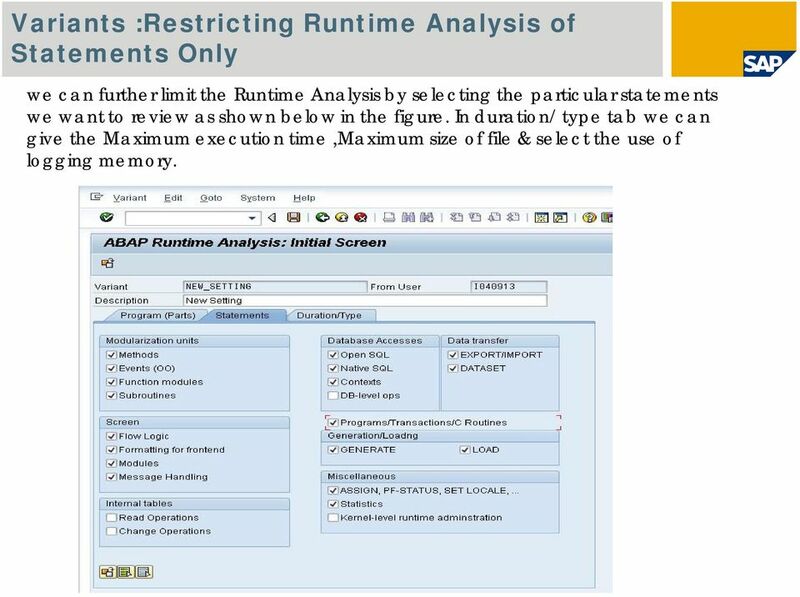 16 Variants :Restricting Runtime Analysis of Statements Only we can further limit the Runtime Analysis by selecting the particular statements we want to review as shown below in the figure. 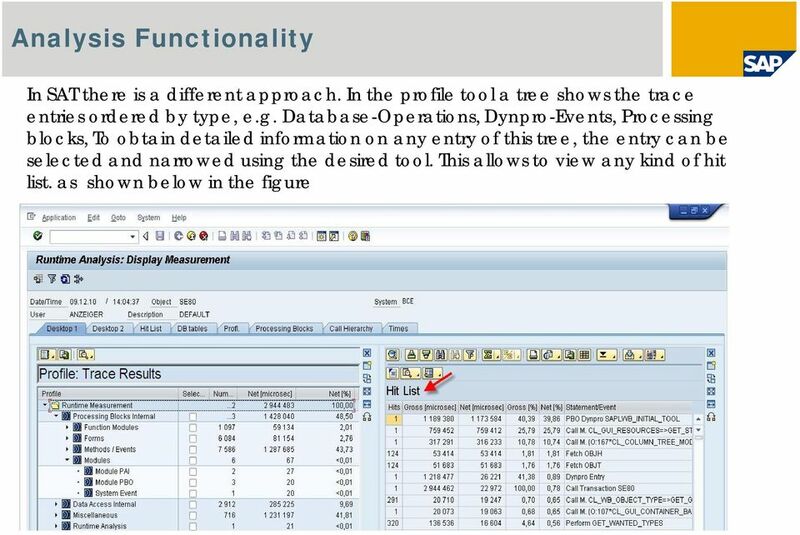 In duration/ type tab we can give the Maximum execution time,maximum size of file & select the use of logging memory.